Now this is an Ag design table in action!! Happy creating so many things... all at once even!! The resin worked for which I am grateful! Prayers answered!! 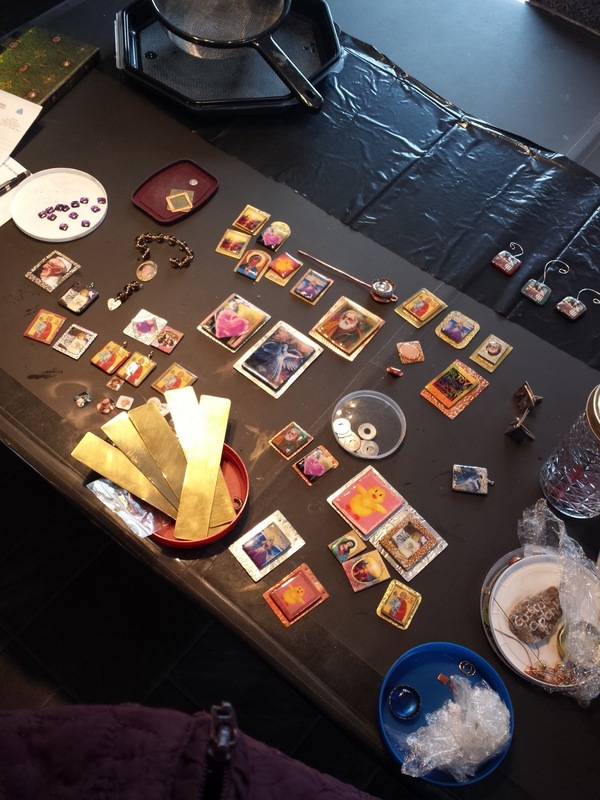 This table is hosting future bracelets, zipper pulls, ornaments, rosaries and precious blood chaplets. I guess you will just have to wait and see the final product!! Enjoy!! Cross this off my bucket list! A beaded wire coil tree of life sort... I enjoy the simple curves and sway of this piece - delicate and yet makes a statement. Simple black linen cording gives the focus to the wire work! A design inspiration from my daughter! Enjoy! 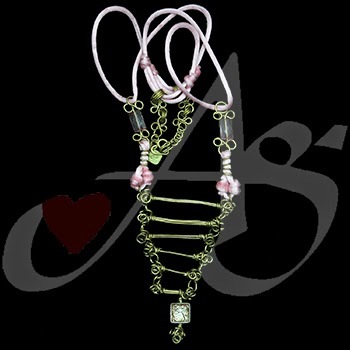 This necklace has whimsy and versatility with the adjustable hang length. I like the handmade baton pieces with the swirl coil balls on the end. Pretty in Pink piece! Enjoy!! I was very pleased with the outcome of this necklace. Every piece was altered threw texturing, including the handmade glass. 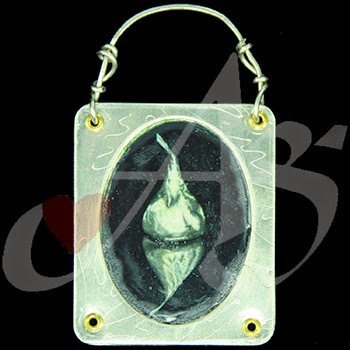 I continued the wisteria from the embossed metal onto the glass piece. I really love this piece. It provoked many compliments - it looks really awesome on! I pray the woman who owns it loves it as much I as do!! Enjoy!! I had fun with this copper and brass bracelet combing piercing work with inscribed etching work. I was pleased with the outcome. There are earrings to match! It wears very nicely on the wrist. Enjoy!! 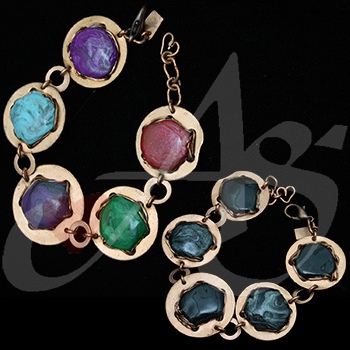 Here is another fun chunky bracelet. I love the embossed metal on this piece of artwork. I am especially happy with the toggle (one of my original designs) since it mirrors the blue on the focal piece. Nice weight to wear in the summer! Bold piece.. I love it! Enjoy! OHHhhh another one of my favs!! 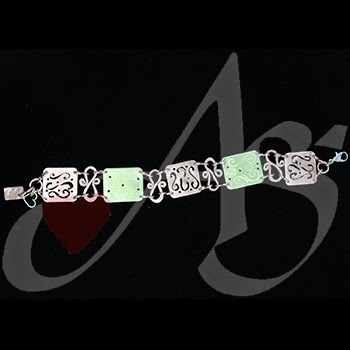 I love this bracelet - it makes a nice little noise when you where it... like the jingle that the angel got her wings! Again an original painting with detail squares of the painting. It also has a new stacking method of displaying the art pieces with under linking. Love this piece. My dear friend owns this one... which means I get to visit my angel!! Enjoy! 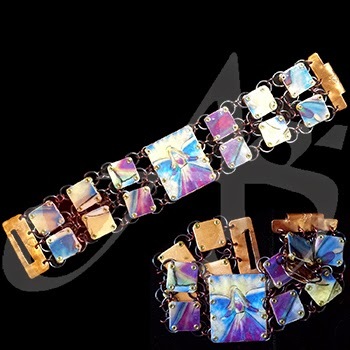 Here is a versatile bracelet - getting two bracelets in one. One side can be worn with the colors showing or flip for a black and white feel. All the colors were custom creative via polymer and the copper metal pieces were also hand cut and wired. Fun piece... Enjoy! 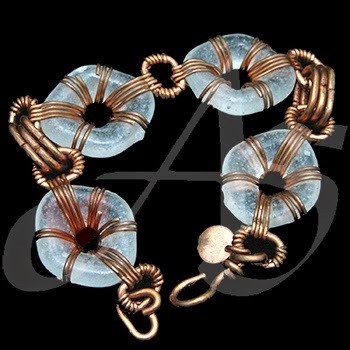 This bracelet is make of heavy gauge copper wire work wrapped around hand made pieces of translucent glass. There are earrings to match. Nice summer piece! 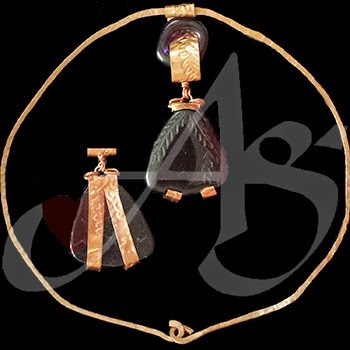 Can be worn with the piece concave or convex! Enjoy! 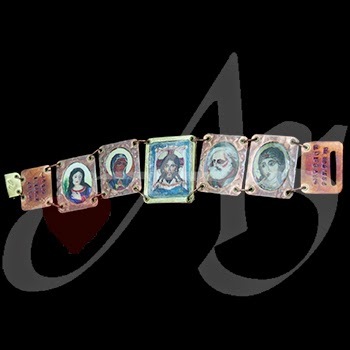 Here is a treasured piece of mine... all images are hand painted originals grouped into a gallery setting for your wrist! OF course all the metal work was also done by hand and maliciously put together. You can see this piece in person down at the Michigan Divine Mercy Center... check out! Enjoy! 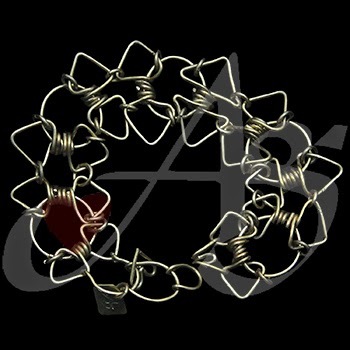 Monday starts a new set of artwear... this hand twisted brass wire bracelet looks very lacy on the wearer. Very delicate and beautiful! It can be worn either way giving two different looks due to the wiring. Enjoy! End this week with St. Agatha, patroness of Breast Cancer... all hand crafted metal and work work again encasing one of my original paintings. Enjoy! metal work riveted frame encasing my painting of "A Kiss from God" - check out my website to see the stories behind all these paintings. Enjoy! 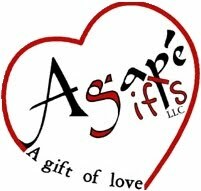 www.AgapeGifts.org - read all about it. 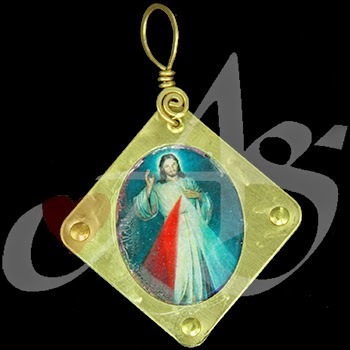 Another Divine Mercy Wednesday pick... an oval frame of Jesus as His blood and water flow. Enjoy! 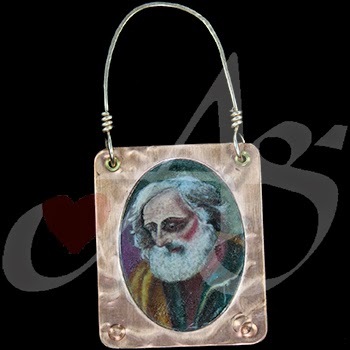 St. Joseph again - in an oval frame all hand manipulated wire and of course my artwork. Enjoy! Framed ornament of St. Joseph... again one of my original paintings. All the metal work was done by hand. Art within Art! Enjoy! 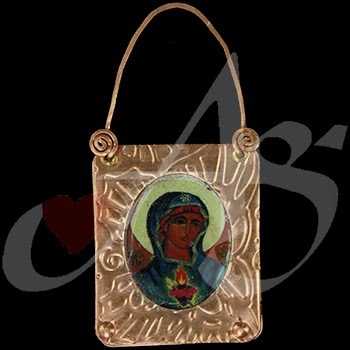 Hand painted Icon of the our Sorrowful Mary encased in a metal hand made copper frame. Could be used as an ornament or necklace... which ever strikes your fancy! 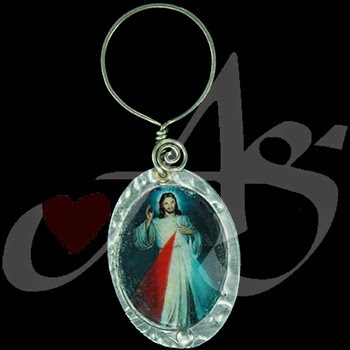 Happy Divine Mercy post Sunday! Enjoy! 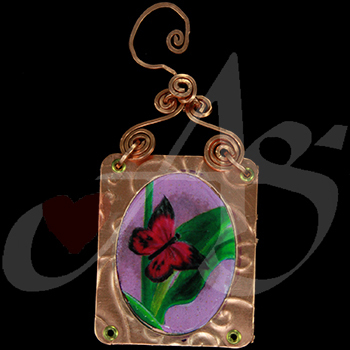 Embossed textured hand created frame and wire work encasing on of my original paintings of a butterfly. The butterfly was a gift from a dear friend during my recovery period! I just love seeing it rest in my orchids... Enjoy! Getting ready for Divine Mercy Sunday!! Remember Divine Mercy this Sunday - hopefully all are remember to pray the DM novena! 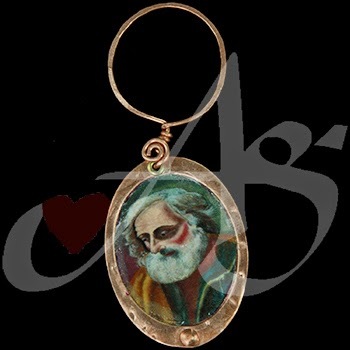 This Christmas ornament is made of brass riveted metal with a framed image of Jesus. 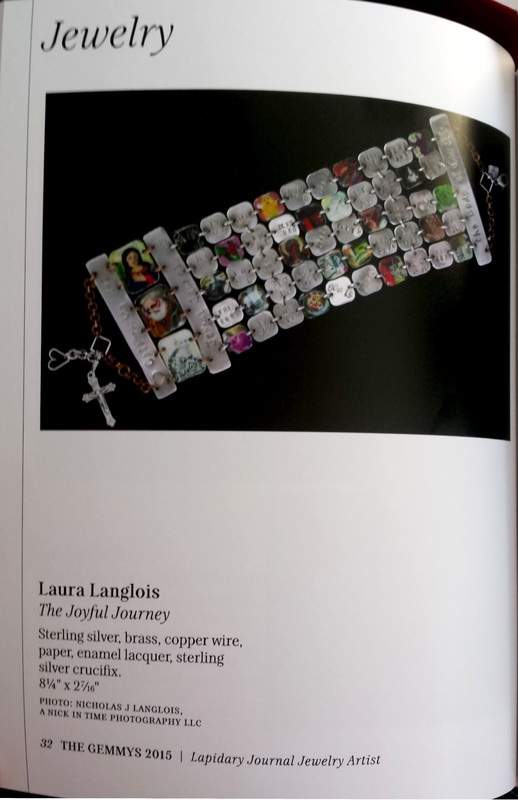 Make a trip to the Divine Mercy Center to see some of my artwork! Enjoy! 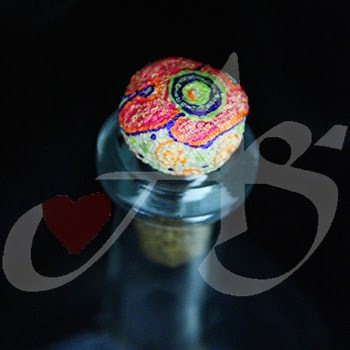 This wine topper reminds me of spring with all the colors swirling into a bloom. Enjoy! This piece debuted on Good Friday - know the beating heart of Jesus died for you, for me, for all. May we embrace this gift of salvation! Jesus remember me as you enter into Your Kingdom. Great News!! 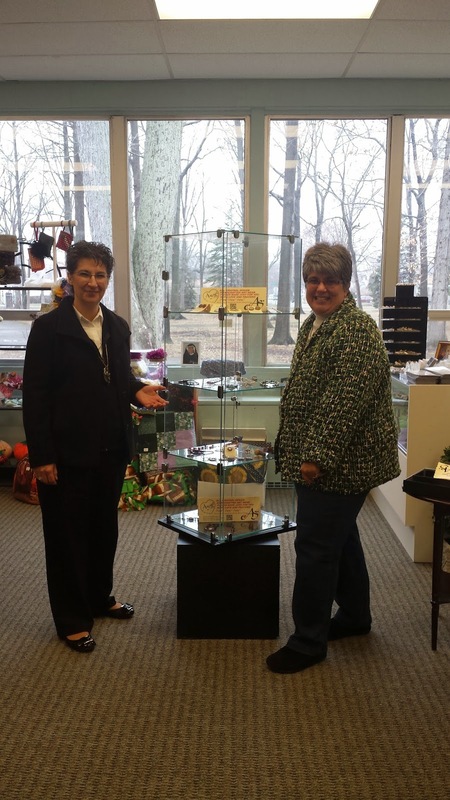 It is official... the Divine Mercy Center and Agape Gifts have teamed up! 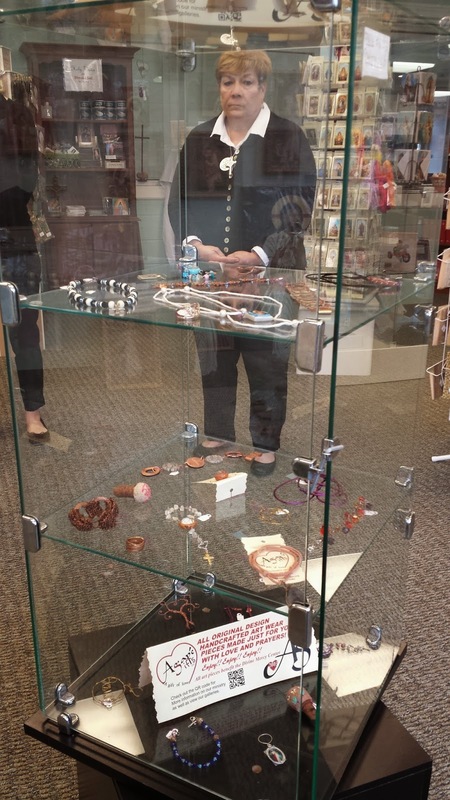 My line of art wear (including rosaries) will be displayed and for sale at the Divine Mercy Center. Four shelves work of great spiritual art! Thank you Catherine and Benedetta!! I am very excited to be working partners with you! Love you both!! Ahola - Easter is here! Another little splash of Hawaiian fun... waiting for spring to arrive fully. 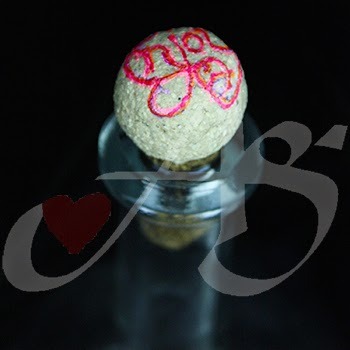 Hand painted hibiscus on the stone knob with cork seal. Happy Easter week! Enjoy! Get some April Fooling going... getting caught up on a week of lost posts! 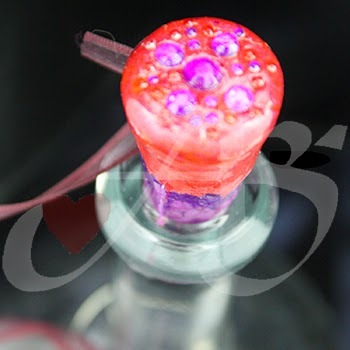 Start out April with some fun colors and visual tricks - great wine topper. Nice solid knob to push down or pull out. Enjoy! HAPPY EASTER WEEK!! JESUS HAS RISEN! HE HAS RISEN INDEED! REJOICE AND BE HAPPY! March is going out like a Rose... well sort of it was snowing but now its snowing more well at least March is over... 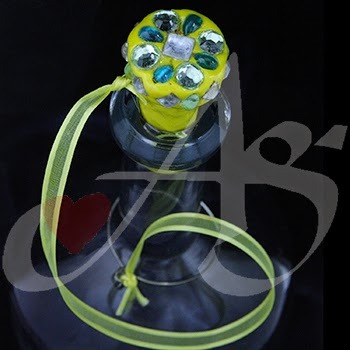 This wine topper will help us remember spring is on its way! Let the Stars from above fall upon you! One of my favs - it all cosmic and sparkly like the sky! ENJOY! Words of reflection on this wine topper... very festive but thoughtful. All hand painted on stone clay with cork clay in the lower bottle portion. Enjoy! 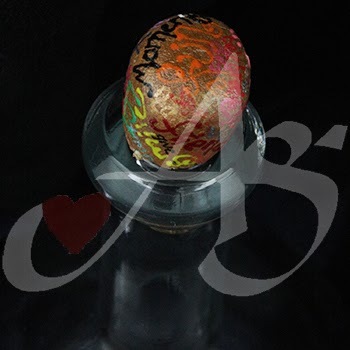 More colorful words of joy in the wine topper... reminding you to celebrate not commiserate! All hand painted parts... stone clay on top with cork clay on the bottom portion. Enjoy! 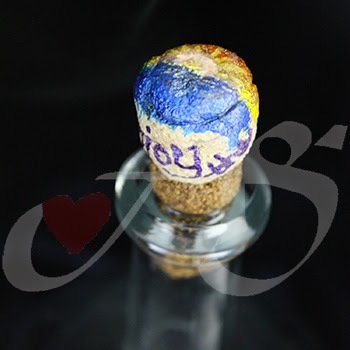 Stone clay wine topper with Joy. All the images are hand painted. 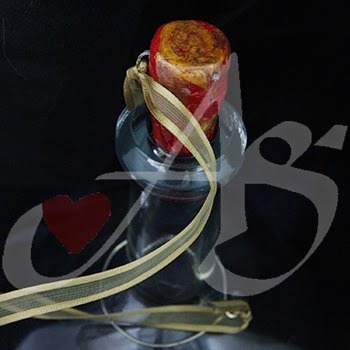 The tongue of the wine topper is made out of cork clay. Enjoy!! Grapes on top and bottom!! The Grapes of Wrath... those who love Veggie Tales! 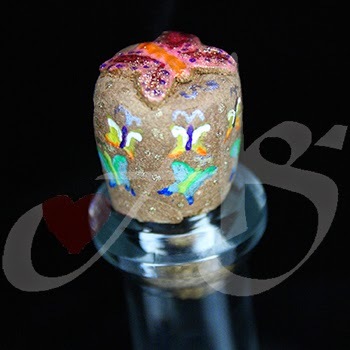 This clay wine topper has a relief sculpture of purple luscious grapes with an imprint of vines around the cork - all hand painted. Enjoy!! The wonderful gift of the dragonfly - reminds me of my in-laws, may they rest in peace. Another example of new life and spring will be upon us! Images are impressed and then hand painted on the stone clay. My sister in law owns this piece! Enjoy!! Look at all the pretty Butterflies!! Ramping it up for Spring! Looking forward to seeing those butterflies soon! This stone clay cork topper has an relief and impressed butterflies... perfect when sipping wine on the patio or deck! Soon very soon! Enjoy! This wine topper has a different appearance. I make with one w stone and cork clay. There is no leash on this one, so don't lose the cork! The graffiti is filled w inspiring words! Enjoy!! Happy St. Patrick's Day!! Perfect topper to end the day! Celebrate safely! Love the greens gearing up for Spring! Enjoy Laddy! Here is the afternoon post... the last one for this round on double posting - made up for my lost week! 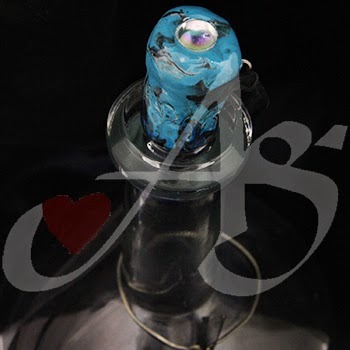 lol Polymer marbled blue and black swirl with a clear bauble on the top. This topper has a stainless steel ring attached to a black organza ribbon. A bit sultry don't you think? Enjoy!! Good Morning Monday... always a day to celebrate! 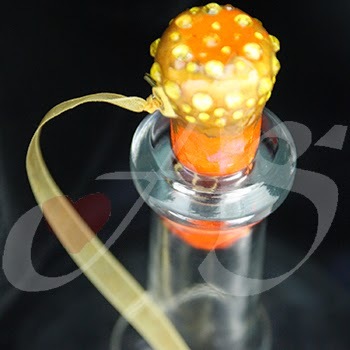 Continuing the journey of wine toppers - this polymer wine topper reminds me of a beautiful sunset or sunrise w the fiery burst of colors. 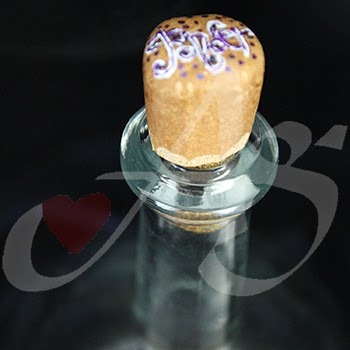 This topper also has a yellow ribbon leashed stainless ring so you don't lose the cork! Very stunning in person! Enjoy! 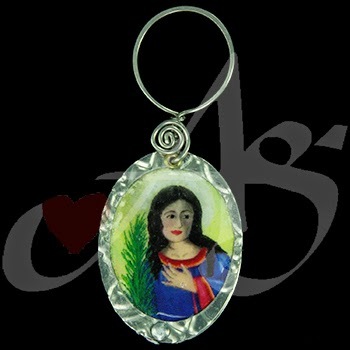 Please check out www.AgapeGifts.org for more great ideas and inspirations. 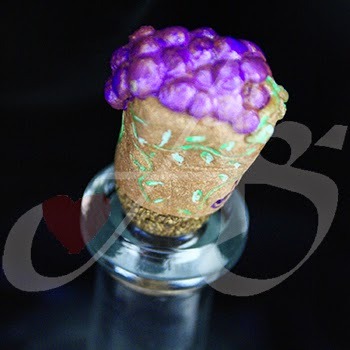 This edgy looking wine topper is a must have! With its black and grey colors, and its blue and clear beads gives it a very cool look. The light blue leash has a stainless steel ring attached to it. Enjoy!! 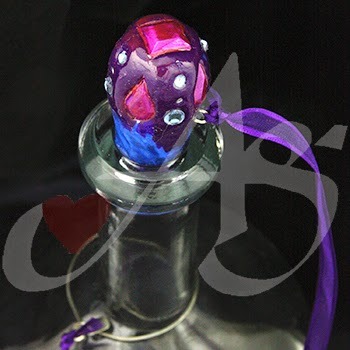 This art work makes me think of the Aladdin movie.This purple and pink wine topper features a purple leash attached to a hand crafted stainless steel ring. 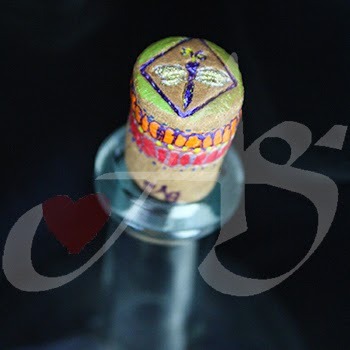 The cork itself, is made with polymer clay, embedded with purple and pink beads. Very Arabian nights! Enjoy!! www.AgapeGifts.org for more creative ideas! 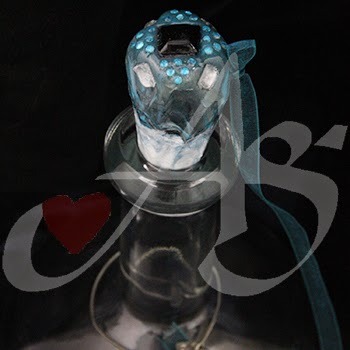 This blue and purple wine topper wear purple and clear embellishments as well as a purple leash with a stainless steel ring. 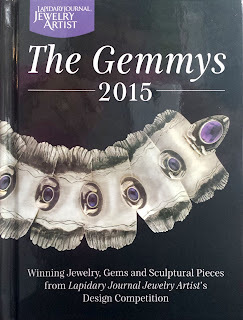 It would be a great gift for any artist! It is beautiful and unique. Enjoy!! 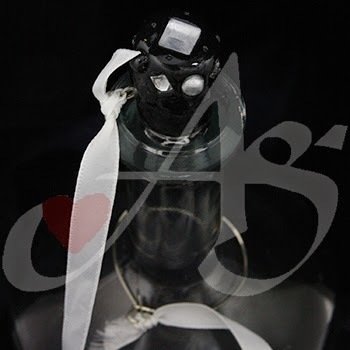 This black and white wine topper attached to a white satin ribbon looks like a tuxedo. This would be perfect gift for a wedding or any classy event. Enjoy! !